It is beauty of the corona which is vain like eyes even if this says anything. 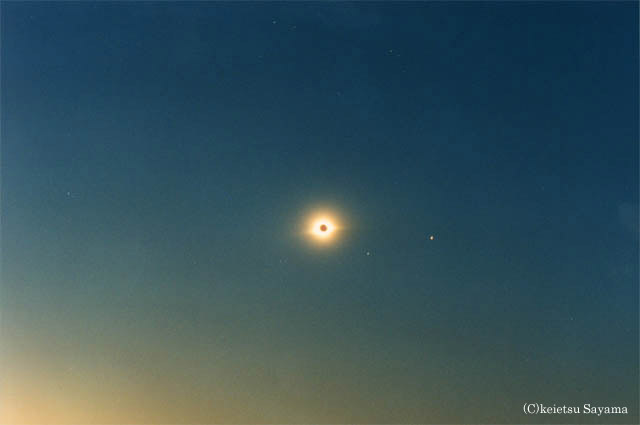 I will not need to forget experience in the Ogasawara offing of March 18, 1988 when I watched a total eclipse of the sun by the naked eye for the first time throughout the life. The sun which lighted up ground is done I of till then on the moon, and temperature falls, and that it becomes cold is felt with skin almost the night. I hear a shout of joy when I greet a diamond ring before long, and the corona which seems to be a fluorescent lamp of form of concentric circle in the sky of a heliotrope shines. For a relationship of a corona, loop-shaped prominence looks red densely. 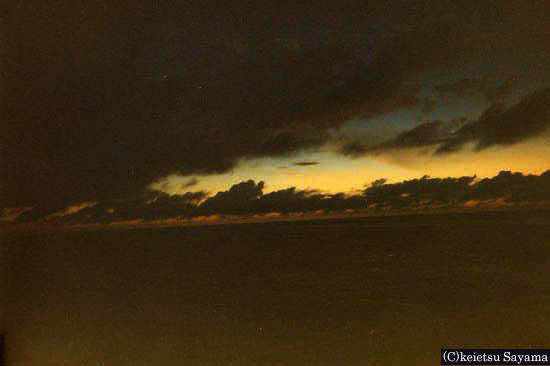 Dim light of dusk is seen for all laps, and the sky is gloomy, and the horizon of the Pacific thickens so as to go if I go from there to a direction of the sun. A total eclipse of the sun is right the rare astronomy phenomenon that full, is felt the five senses. Because the earth covers the moon, as for the eclipse of the moon, all existing L state continues for more than 2 hours. Because they are seen at night somewhere, two or three once a year is seen in Japan. However, a solar eclipse is not seen in a point for several years due to a while ago either. I follow only for two or three minutes in duration of a total eclipse of the sun on an average. In addition, only 300-400 once a year is generated when they look without changing a place like an eclipse of the moon on an average. For example, a total eclipse of the sun is not seen until August 24, 2063 since a total eclipse of the sun was seen in Aomori on June 3, 1742. I have free interval of 321 years only in this. A next total eclipse of the sun continues soon in Hirosaki-shi in Mutsu-shi for about 3 minutes for five minutes. OK, you "pursue romance in the black sun from now on and" do not look? Conventional view of life should change considerably!